One of the most colorful railroads in the Southeast. The C of G owned trucks and steam boats in her life and today is beloved by many. With an aggressive historical society that saves and promotes her heritage. Visit them at http://www.cofg.org for more information. 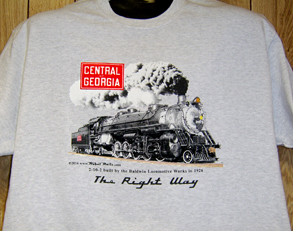 Central of Georgia Railroads massive 2-10-2 steam locomotive, able to pull long freights all along the line. So authentic you just might feel a rumble in your shirt! 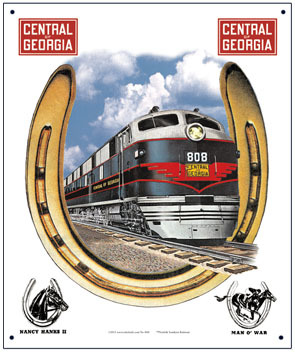 Central of Georgia Coffee Mug featuring a beautiful streamlined passenger diesel pulling the Man P War through a symbolic golden horseshoe. Classic logo appears on the reverse side. Central of Georgia Coffee Mug featuring an F Unit diesel heading up a manifest freight through the Georgia countryside. Classic logo appears on the reverse side. 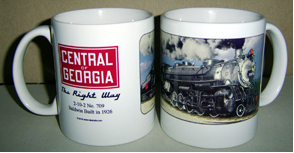 Coffee Mug featuring the Central of Georgia Railroads logo superimposed over the paint scheme of its diesel locomotives. Coffee Mug featuring an image of one of the Central of Georgia Railroads largest and most powerful steam locomotives, the #709 a 2-10-2 monster built by the Baldwin Locomotive Co in 1926. Central of Georgia Railroads colorful E-7 passenger diesel heading through a golden horseshoe in honor of its two premier passengers trains named after famous horses, the Man O War and the Nancy Hanks II. 6 inch x 6 inch square tin sign of the Hand logo used by the Central of Georgia Railroad. 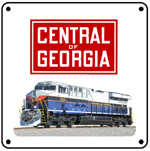 6 inch x 6 inch square tin logo sign of the Central of Georgia Railroad, The Right Way. 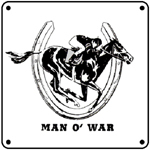 6 inch x 6 inch square tin sign of the Man O War image used by the Central of Georgia Railroad. 6 inch x 6 inch square tin sign of the Nancy Hanks II image used by the Central of Georgia Railroad. 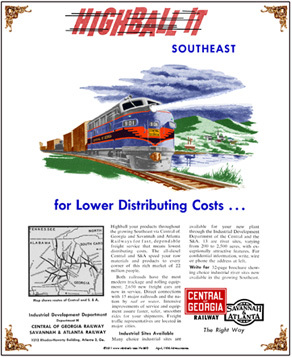 Central of Georgia Railroad known as the Central Railroad of Georgia on this old/early logo seen in print advertising and on many early freight cars. A very unique logo. 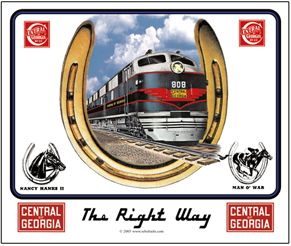 6 inch x 6 inch square tin logo sign of the Central of Georgia Railroads premier streamliners, the Nancy Hanks and the Man O War presented in a horse shoe emblem. 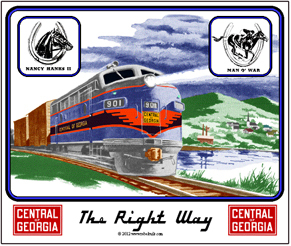 Central of Georgia License Plate featuring logo and The Right Way tag line plus images of its two premier passenger trains, the Nancy Hanks II and Man O War. 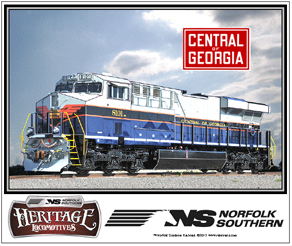 The Central of Georgia Railroads E-7 passenger diesel is featured on this colorful mouse pad. 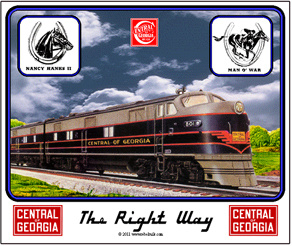 Mouse pad featuring a Central of Georgia E'diesel flying through a classic horseshoe, representing the two premier passenger trains on it line: The Nancy Hanks II and the Man O War. Mouse pad honoring the new many Central of Georgia freight diesels carrying on their daily duties, keeping that freight moving. 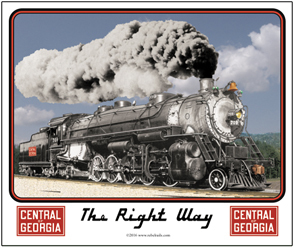 Mouse pad showcasing a Central of Georgia steam locomotive built to move heavy freight trains. Tin sign featuring an advertisement for the CofG Railway promoting the road in 1947. 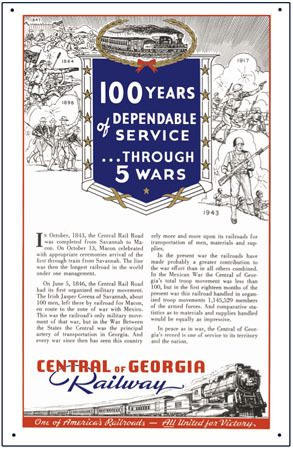 Tin sign featuring an advertisement for the CofG Railway promoting its 100 years of service through five wars. A very interesting and unique sign. 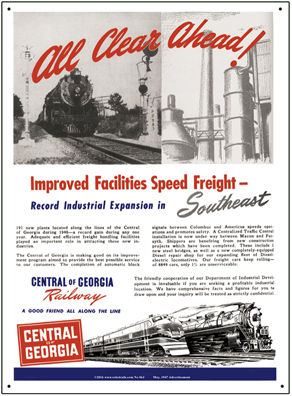 Tin sign featuring a 1956 advertisement for the CofG Railway promoting its Highball Freight service. A very unique and rare railroad sign.